Cleveland Scene held their annual United We Brunch event at the Galleria downtown Saturday, January 21. If you aren’t familiar Cleveland Scene events, then I need you to stop what you’re doing and check out my Flavor post from December so you can be hip to what I’m about to share. As I’ve said before, I love Cleveland Scene events. Find a large space, food vendors from all over the city, a few alcohol sponsors, a DJ, and you have one hell of a party. The diversity is pretty cool, and it’s one of the reasons I keep me coming back for more. Well that, plus the drinks and food. The brunch officially started at 11:00 a.m. and lasted until 2:00 p.m. Shana and I had a ball and if you plan to go to next year’s brunch if they have one, here’s an idea of what you can expect. Get access to the event an hour before the brunch starts. Get extra drink tickets and access to a full bar on the second floor with additional seating. Enjoy shorter lines to get your food and alcohol before the crowd gets crazy. Mimosa’s and Bloody Mary’s come courtesy of Tito’s and Pope’s Kitchen. Beer and wine are also available if you don’t prefer the hard stuff. The DJ spins the best music. You can’t help but sway while enjoying your food and drinks. Food galore! There were so many local restaurants serving up their dishes. It was a perfect opportunity to try new dishes and find a new meet up or date night place. 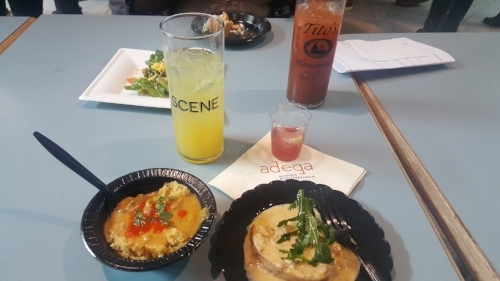 Although the event is a brunch, there were a variety of local vendors selling all sorts of products, including venues hoping to get people out to check out their spaces. This event sells out and the crowd packs the Galleria. It might be hard to find a seat to enjoy your food if you don’t have VIP status. Shana and I suggest that you go with a group of friends, find a table, and take turns refilling your food and drinks. It’s hard to think that we’ll have to wait an entire year until the next United We Brunch. You better believe that we’ll be the first to get our tickets so that we can eat, drink, and have fun! Were you at the brunch this year? Drop a comment below and share your experience.